This Signature Teardrop Long Dangling Earrings for pierced ears are Fun to Wear, Silver and Gold Tones to match with your clothing. Wedding, night-out party, casual earrings everyday wear, Perfect for any Occasion. 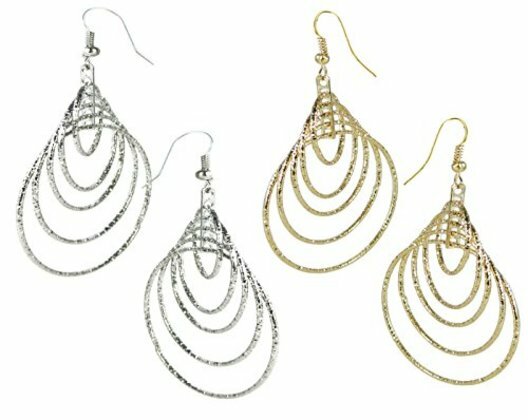 1 Pair of Gold Plated Drop and Dangle Loops : Length - Top to Bottom 2.90", Width 1.5"
1 Pair of Rhodium Plated Drop and Dangle Hoops : Length - Top to Bottom 2.90", Width 1.5"
Fine and Light Weight, Will Not Feel Heavy on the Ear. None Allergy. The Diamond Cut finishing makes this Statement Earrings Shinny n Sparkle in light. Secure Clip On Earrings. Gift-ready, comes with beautiful Gift Pouch. Hot Topic Earrings.